A saddle is created, were a lower roof joins into a higher one; at right angles. The lower roof always consists of two valleys. The higher roof is nearly always in straightwork… The valleys may have been created by an extension to the main elevations or by a turning dormer window. Both are treated in the same manner. 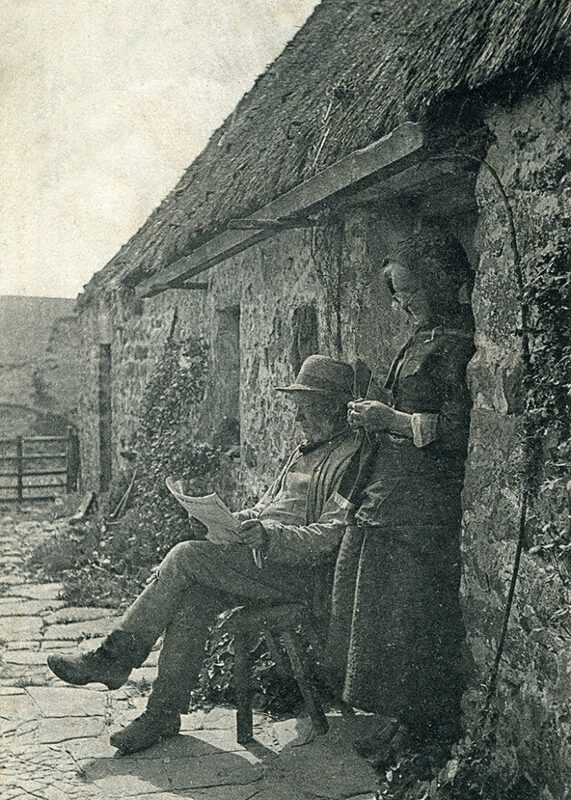 And share the drawback, of creating a potential weak point in the thatch; where the two roofs join… But as with a valley, this can be alleviated, with some judicious use of lead sheeting. In the section on eaves chimneys, I mentioned that a saddle can be used behind a chimney; instead of a lead gutter. However the weak point, just mentioned, is then created. And being situated towards the bottom of the roof, there is an awful lot more water to shed with this type of saddle. 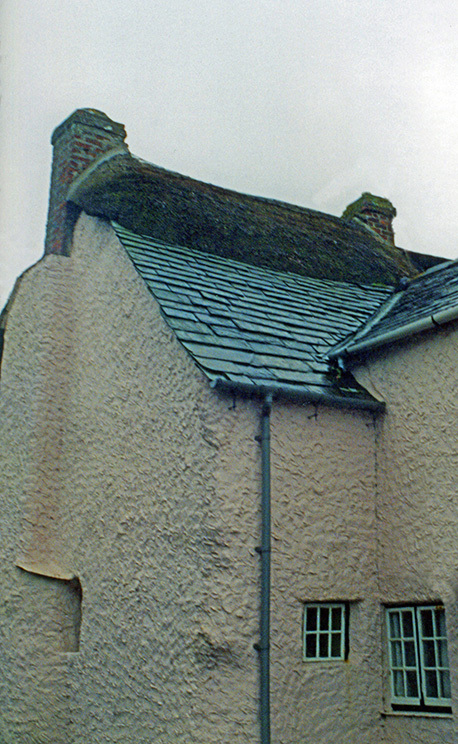 Hence the modern popularity of lead gutters… But in the past, thatch was a lot cheaper than lead… The working methods used, are the same, as for the other applications of this feature. The thatcher firstly has to complete the coatwork on the two valleys, that make up the lower extension. The second ridge roll should also be laid, and covered by the levelling course, or top sett; on this lower section. Then the final ridge roll and ridge, should also be completed; for at least 5 feet (1.5m) out; from the junction of the lower extension, with the upper main roof. It is good working practice, to then cover the first 3 feet (90cm) of this ridge, out from the main roof, with some lead sheeting. This helps to counteract the weak point in the thatch; where water from the main roof, runs into the top of the ridge, of the lower one… Sheeting over this vulnerable spot, turns the rain water straight down into the valley, in effect bypassing the top of the ridge. Typically, the thatcher will have stopped work, on the upper courses, in the main roof; when the lower ones started to turn, to create the first valley of the lower extension. These upper courses are now brought over the completed section of ridge, continuing as straightwork. It is good practice to thatch over the ridge, in the same fashion, as a very small eyebrow window… By bringing the first two courses right over the ridge, then fading out more as necessary. A full thickness of thatch, over the lead work, will thus be created. 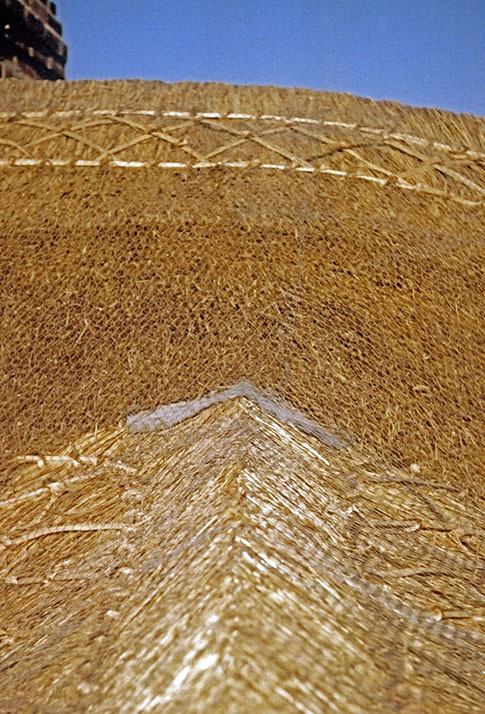 A line may show, in reed thatching; where this upper straightwork sits on top of the turning valley thatch… The price paid, for mixing the two groups of features together. Thatching a saddle… Using a butts up ridge. The left image shows the top of the extension, with one half of it’s roof and ridge complete. The right hand photo shows the completed feature, with some lead sheeting discreetly placed. Saddles… The left thatch, at Morchard Bishop, in Devon, has a leaded saddle, connecting the main roof to an eaves chimney. Saddles used here, are a smaller and shorter version of those used when an extension joins a main roof. 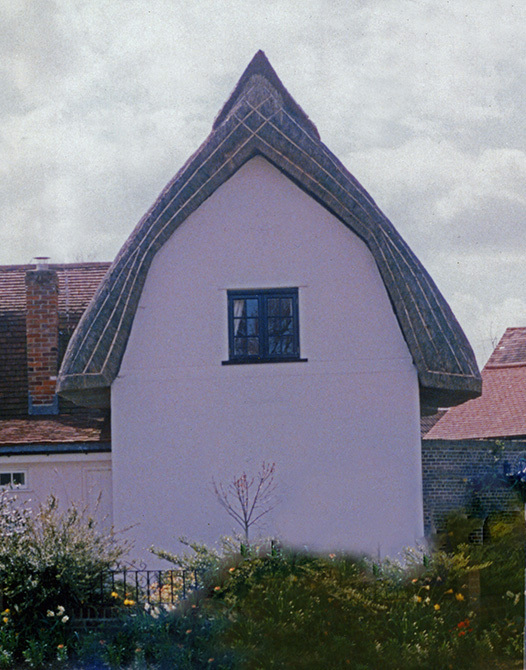 The right image shows a very complicated hipped roof, at Briantspuddle in Dorset; this has a neat saddle, to turn the water aside; from the hipped window ridge. Circular thatch… Round and round. 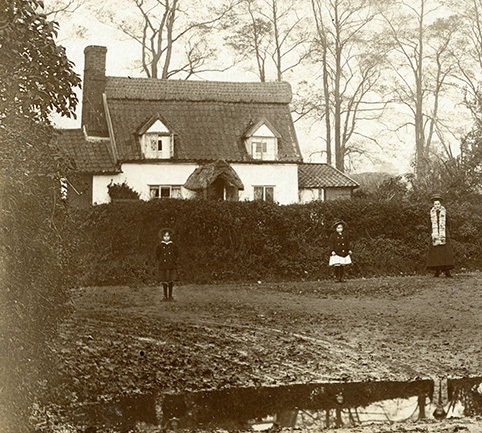 The round thatched buildings found today are mainly ornamental… Consisting of lodges, summerhouses and follies; often dating from the Picturesque period, of the early nineteenth century. Others are farm buildings; the former sites of a horse mill. Where animals provided the power for early machinery; by walking an endless circular journey… Yet none survive in any great numbers. 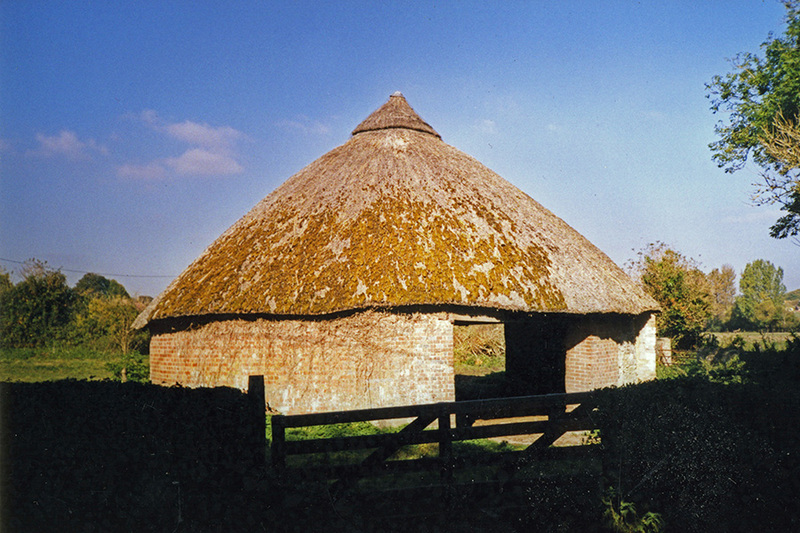 The above thatch once housed an old horse mill; now empty, at Winterborne Whitechurch, in Dorset. 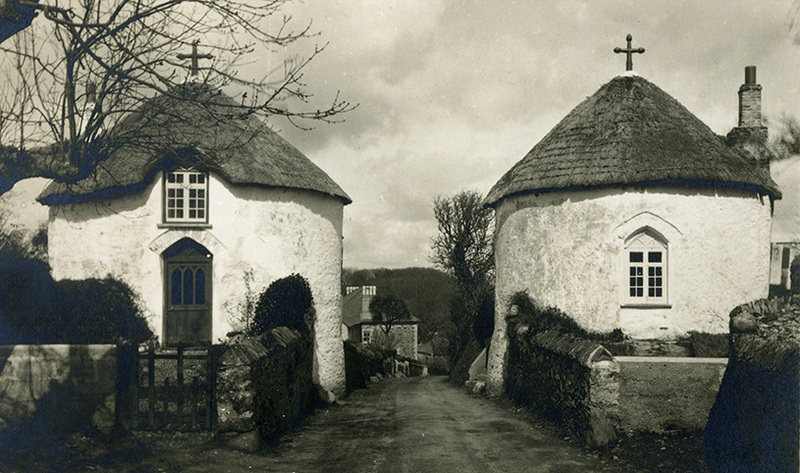 The two round cottages below; showing their thatch, in the 1920’s; still guard the entrance to the village of Veryan, in Cornwall. 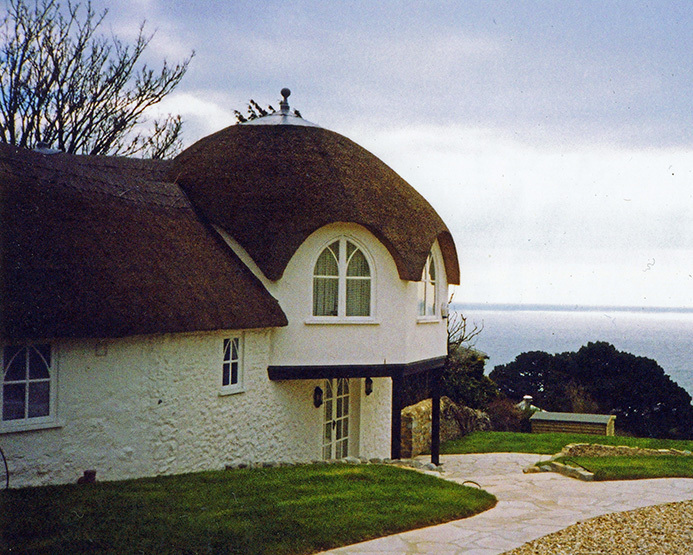 This rarity may give the impression that round buildings are difficult to thatch. Not so… After all dozens of generations of Britons lived under such roofs; in the Iron and earlier Ages. As all the turning is constant, there are no extra courses to add or subtract; as with hips and valleys and turning gables. It has been said, that round roofs are more difficult to estimate for than to thatch… But this is also fairly straightforward. Take the distance, from the top of the roof, down over the eaves, to the wall. And multiply this length, by half the circumference of the thatch, around the eaves… The answer should be in square feet or metres. There are also half round roofs… Perhaps forming the end of a normal roof… All the above rules apply here, except for the estimating. 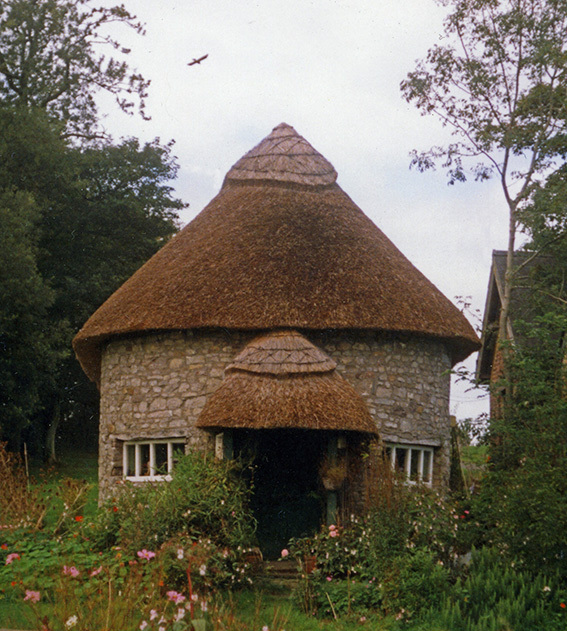 Where a quarter of the eaves length will suffice… Thatch really suits a round building. A fact that should be remembered, when such a design is considered… Shapes that would make the best tilers and slaters blanche, are easily overcome by the thatcher. A half round thatched end, above; at St Nicholas, in Glamorgan. And a new extension, on the right, at Lyme Regis in Dorset. 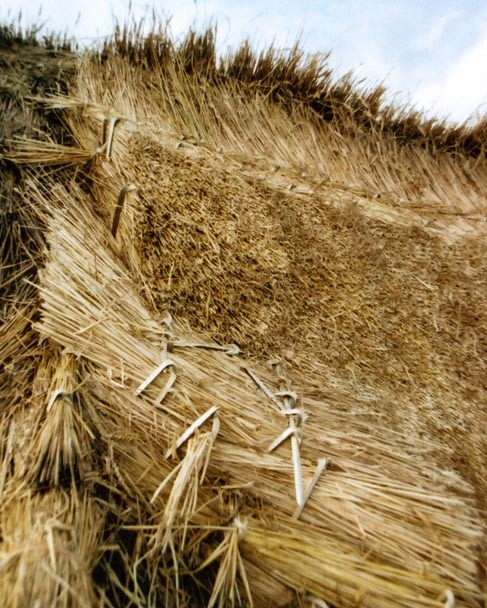 Mansard Roofs… Two pitches, one thatch. 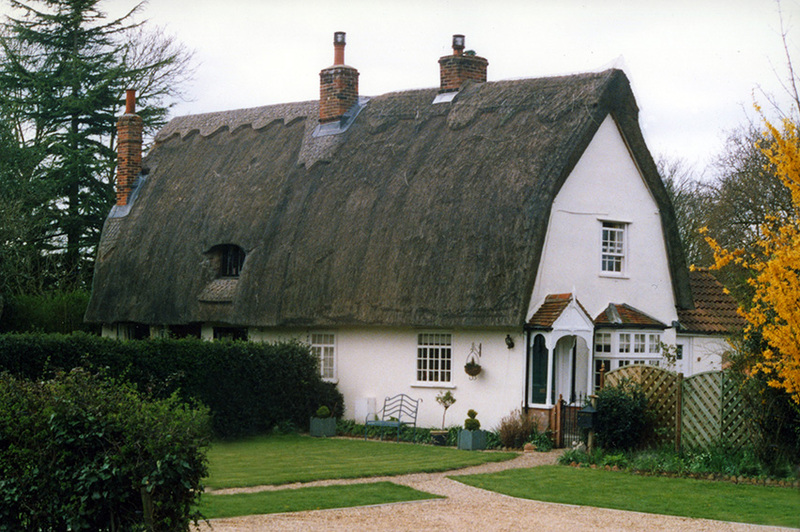 This is a rare feature, in thatch; except in Essex and some other parts of East Anglia… This type of roof is created, when the upper storey of a cottage lies entirely within the roof space; and extra ceiling width is then added. Resulting in a very steep lower section of thatch; which covers the sides, of this type of roof; in effect taking the place of the wall… And a flatter upper section of roof. 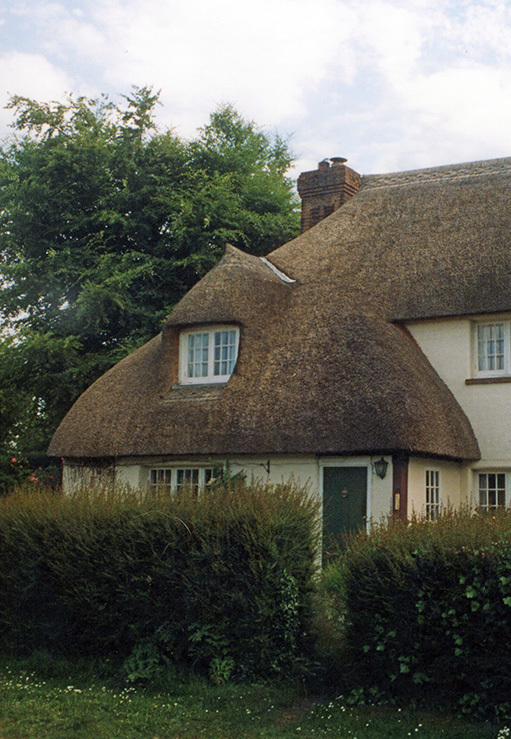 Like circular roofs, these twin angled thatches look very difficult; but are relatively straightforward to thatch… The main area where mansard roofs occur, has a strong long straw thatching tradition; this is more than a coincidence, as this feature is much easier to complete, in this shorter material; than in longer, less forgiving water reed..
A typical Essex mansard thatch, at Great Horkesley. 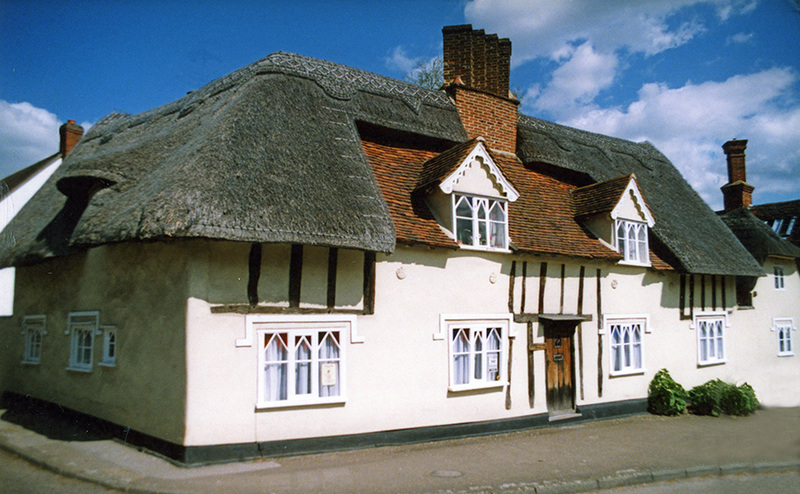 Mansards… The thatch, at Great Dunmow; and the right gable end at Shalford; both in Essex, show in turn a thick multilayered mansard thatch, and the decorative sparwork, that often finishes these roofs. Tiles, Slates, Gutters and Thatch… Working with alien materials. Here an overhanging eave can prove a liability. 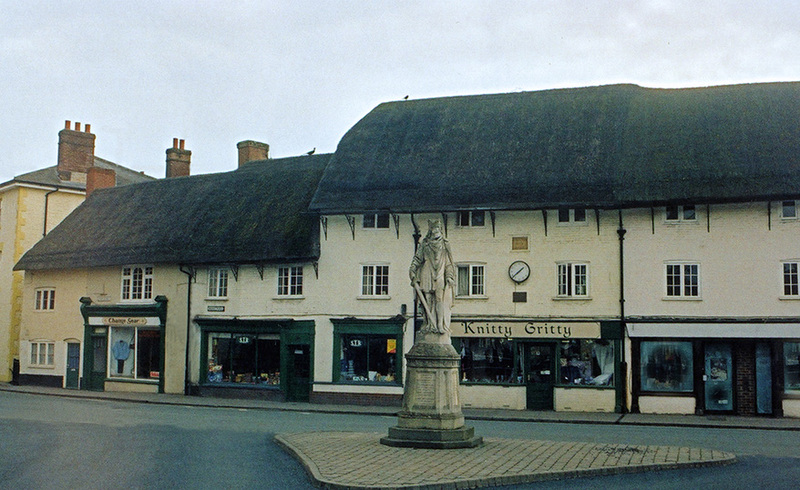 Thatch can be damaged, by large vehicles passing too closely. Whether on a busy street or down a narrow country lane. Agricultural machinery can be pretty hefty; as well as large commercial vehicles … An answer to this problem, is to remove the overhang; setting the thatch back; so that it lies over several courses of tiles or slates. And only comes level with the outside of the wall. With around 18 inches (450mm), of tile or slate in place, the thatcher can fix a normal eaves course over these. And then continue to thatch normally… Very little tile or slate will show. This method has been used for a great many years, on thatch in both village and town. Hazardous… But an eaves of stone tiles, has kept the thatch, of the left hand cottages, at Stalbridge in Dorset; safe from passing traffic for many years… I have never heard of any accidents, caused by falling icicles, but a gutter, over any entrances, to a thatch property, would solve this problem. 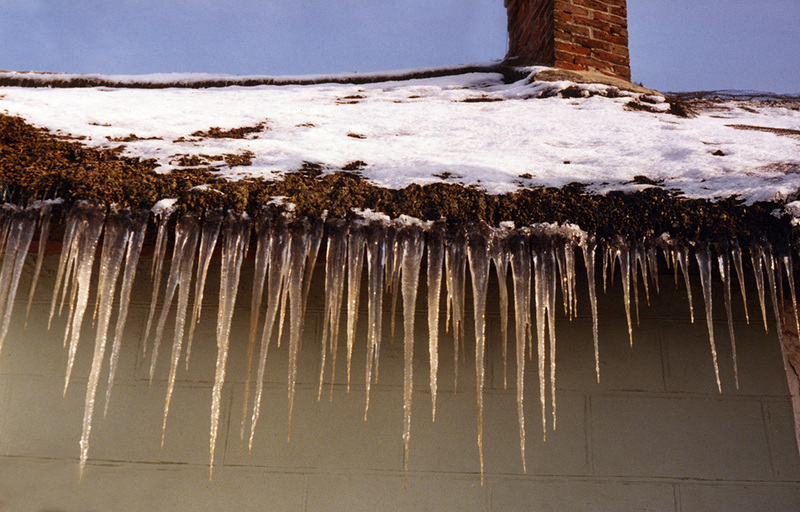 A gutter is often added to this type of roof. They can also catch the drips, from thatched roofs with a normal overhang; saving a soaking, for passers by, if in a public street. Or the owner, when leaving and entering their property… Large wall brackets are needed, to set a gutter, under a overhanging eaves. A normal guttering system will suffice, for thatch set back over tiles. 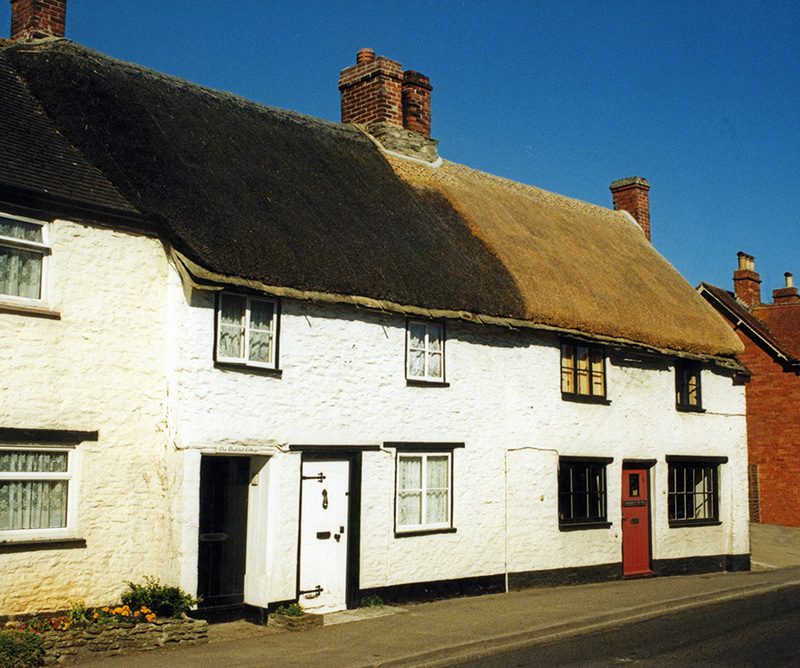 One sided thatch… The roof, on the left, shows tiles topped with thatch, in Norfolk; near Kilverstone, in 1915… A modern example, on the right; at Marchamchurch, in Cornwall. 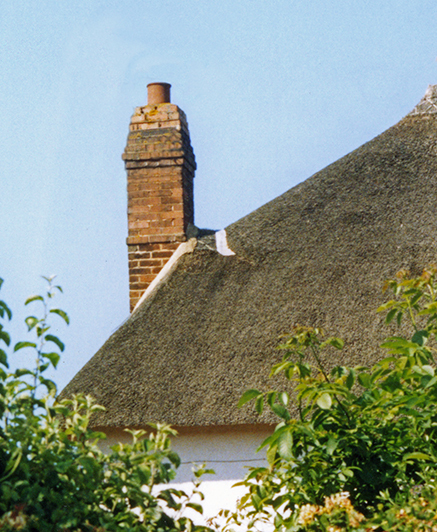 Whole roofs, of tiles, slate and thatch, are also found together, in a terrace situation… Here, the thatcher must join into these neighbouring roofs properly. 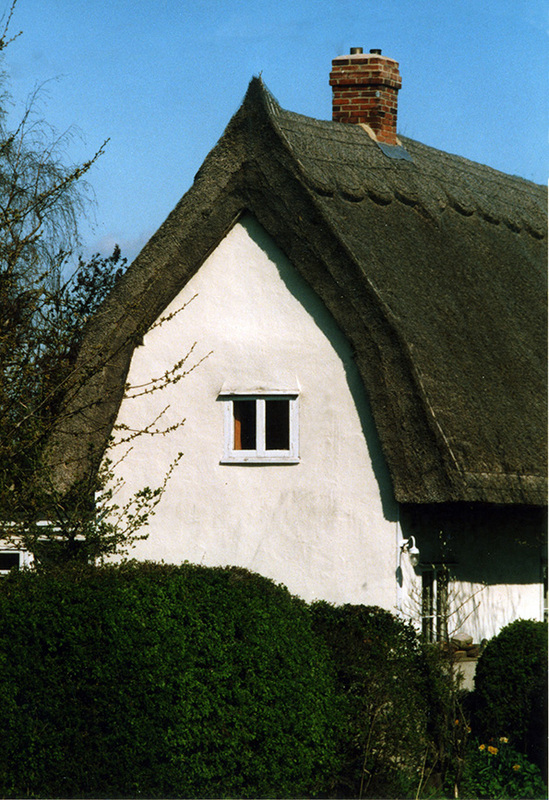 Being thicker, thatch usually sits above any tiles or slates. These need to be covered by the correct amount of thatched gable end. Old tiles and thatch can look well together… Having the best effect, where thatch covers the majority of the roof. Thatch and tile… Even thatchers have admit they can look good together… As the thatch at Great Bardfield in Essex clearly shows.